Product Details Japanese Junipers have a naturally flowing or "cascading" shape of long, trailing branches, and can be trained into many amazing Bonsai shapes. The branches respond well to wiring and reshaping. Picture is for example only. As an indoor bonsai, the Japanese Juniper should be in a very bright, but cool location. A south, west or east window is ideal. For best growth temperatures of 60 to 70 degrees are ideal. If the air is dry in your home grow the bonsai on a humidity tray or mist once or twice daily. The plant itself should be kept evenly moist, but not wet or dry. 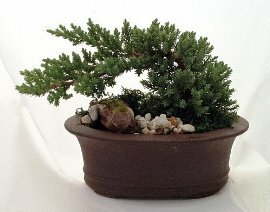 Japanese Juniper Dwarf Bonsai Tree is growing in a 7" x 6" x 3" ceramic container . The plant stands about 4" high.